Recently, I presented a demonstration of how to connect to a Bluetooth Access Point (Bluetooth Hotspot) using the iPAQ 3975. Here are the screen shots of the steps I took to connect to the Bluetooth Hotspot. These steps work for the iPAQ 3870/3875 as well since they both use the same Bluetooth Manager. Click on the Today screen. Then click on the Bluetooth Manager icon in the lower right hand corner of the Today screen. Turn on the Bluetooth Radio if it is not already on. 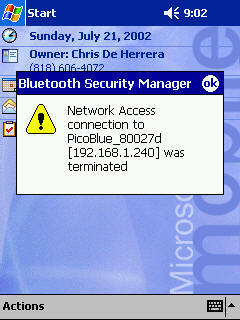 Once you have launched the Bluetooth Manager, you will see a list of devices that have been seen by your Bluetooth card. If your Access Point is not listed then click on the menu option to Search. While the Bluetooth Manager is searching, you will see a screen similar to the one below. Just click the OK button when the search is complete. Once the search is complete you will see your Bluetooth Access Point listed in the Bluetooth Manager. If you click on the Access Point then you will see a screen like the one below. It lists all the device information such as the device address, device type, device bonded and when it was last seen. To connect click Action and select the option "Connect to LAN Access Using PPP". If you right click on the Access Point then you can choose the option "Connect to LAN Access Using PPP"
Once have clicked on the option to "Connect to LAN Access Using PPP" you will connect to the Bluetooth Access Point. The connection will be complete when you see this screen. You can click "Hide Status" to view the Today page or launch any other application you want. Once you are connected you can launch the Bluetooth manager and check the status of the connection to the Bluetooth Access Point. You will see a screen similar to the one below. Once you are connected, you can disconnect by clicking on the connection in the lower right hand corner of the Today screen. Then click the button Disconnect. You will see a message similar to the one below. Note: This does not turn off the Bluetooth Stack. Now you can connect to your Bluetooth Access Point (Bluetooth Hotspot) with your iPAQ Pocket PC!